Come Down for the Kids’ Easter Party! 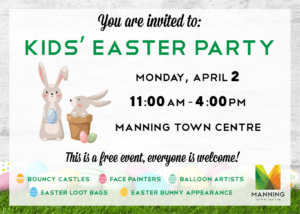 Manning Town Centre>News and Events>General>Come Down for the Kids’ Easter Party! The snow has melted and the days are finally getting longer. It’s been a long winter so let’s spring into a new season with an Easter party for the entire family! Bring the kids for some family fun on Monday, April 2 from 11:00am to 4:00pm at Manning Town Centre (in front of Cineplex). We will have bouncy castles, face painters, balloon artists, Easter loot bags, and even an appearance from the Easter Bunny! The best part? Admission is free. We can’t wait to see you there!